So you’ve gained an interest in the thieves’ guild? How interesting. Well, not just anyone can waltz in, you know. First you gotta prove to us that you’re not some undercover guard from Bree or the like, looking to cause trouble. Lucky for you, a certain well known hobbit who was “not a burglar” left a few ideas laying around that you should master before we test you. Give them a read and let me know if you still want in. Positional Attack: an attack which specifically states that it will do more damage from behind. There are currently no other positions which add additional damage for Burglars. Attack from Stealth: not as cut and dry as the name implies, in Gambler or Mischief-maker spec, this can only be used on the initial ambush from Sneak or Hide in Plain Sight. In The Quiet Knife, this is either the initial attack from Sneak or Hide in Plain Sight, or the next attack that can gain additional traits after using Feint Attack. Blue Line: The Gambler specialization. This is someone who, during trait tree selection, chose The Gambler bonuses before putting points into the trees. This is indicated after the fact by the color and contents of the far left ribbon in the trait tree. Red Line: The Quiet Knife specialization. This is someone who, during trait tree selection, chose The Quiet Knife bonuses before putting points into the trees. This is indicated after the fact by the color and contents of the far left ribbon in the trait tree. Yellow Line: The Mischief-maker specialization. This is someone who, during trait tree selection, chose The Mischief-maker bonuses before putting points into the trees. This is indicated after the fact by the color and contents of the far left ribbon in the trait tree. HIPS: Hide in Plain Sight, an ability available to all Burglars that allows them to disappear in mid-fight as an escape mechanism, or, less commonly, to create an opportunity for a second ambush. Effect, Buff, or Debuff: this is a state applied to your character, where an effect can be either a Buff or Debuff. A buff is a beneficial effect, whereas a debuff is a negative effect. Critical Response Skill: an ability that is opened by beneficial temporary effect only after landing a critical or devastating hit on an enemy. Opens the ability to use a Critical Chain Skill. These skills include Double Edged Strike and Gambler’s Advantage, and they are interchangeable to one another. Critical Chain Skill: an ability made available by beneficial temporary effect after successfully landing a critical response skill, to be used as a follow-up. Stun: an ability which temporarily incapacitates the enemy, but gives them a temporary stun immunity buff, preventing anyone else from stunning them again for a time period. Daze: an ability which temporarily incapacitates the enemy, without giving them a temporary stun immunity buff. This is also sometimes referred to as a crowd-control ability. Fellowship Maneuver, FM, Broken Defenses, CJ, Conjunction: a temporary state where the mob is incapacitated, giving players of the fellowship which put them into that state the ability to perform a group ability. This can include damaging the enemy directly, applying a Damage over Time effect, restoring morale (healing), restoring power, or a combination of the above, based on the combination of the selections by all participants. This is an especially important concept to know as a Burglar, as we cause a great deal of these to occur directly and indirectly when in fellowships. CJ or Conjunction is a deprecated phrase from Beta, but you will still sometimes hear it used. The game will always refer to it as a Fellowship Maneuver or Broken Defenses. It is important to note that each Burglar is different in their own right, but there are some basics that all Burglars learn at some point in their lives. Before you go getting yourself into combat, you should know how to avoid it in the first place. First and foremost, stealth is your friend. I suspect you probably already knew this before getting involved with Burglary, but let’s go over some of the details anyway. As with most things in life, there are rules to how stealth works. Here are the important ones. Stealth Level: Your detection is based on your level vs. the level of the mob + your stealth level modifiers – their stealth level modifiers, and used as a modifier on a roll. Thus, if you approach an on-level mob with no stealth level and you have no stealth level bonus yourself, it’s a modifier of 1, but a roll to determine if you will be detected. However, if you have a stealth level of +5, now your roll modifier is .2, and as such, you are much less likely to be detected than you were without the stealth level. However, if your opponent also has +5 stealth level, you’re back at a 1. If you approach a mob lower than you, odds are, they won’t detect you at all, because your modifier keeps you out of their range. On the contrary, approaching a higher level mob just might be suicide without some serious modifiers. Stealth detection: The ability for your opponent to detect you is greater in front of your opponent than behind. I cannot stress this enough. You can practically bump into most enemies if you’re approaching from behind, but if you approach from the front, you’re almost certain to be seen. You could think of this as adding to or subtracting from their stealth level modifier as well, depending on if you’re in front of them or behind them. One of the first abilities all Burglars learn, and the staple for all things stealth. Sneak can be used in situations where no damage will be taken and extended duration is required. Sneak is easily broken by a single point of damage of any kind, so it is imperative that it not be used to sneak up on a mob with an aura, and not used to sneak up on someone with an Area of Effect skill, as you will be found, and you have now lost your ambush and your ability to remain unnoticed. Sneak also has a detrimental effect that slows the Burglar down. In Yellow line, this is impossible to get rid of without putting points into one of the other trees, but Yellow line is not designed with stealth in mind (more on that later). Blue and Red line may get their Stealth Movement Speed back up to 90% using trait points, and after level 50, Legendary Item legacies may be used to make up the remaining 10% if desired. The second ability Burglars learn that allows them to move stealthily is HIPS, or Hide in Plain Sight. HIPS has two additional benefits: damage will not remove you from stealth, and your stealth modifier is effectively zero (see Stealth Level). The down side to this is that it only lasts for a few seconds and has a long cool down, so you have to make your move quickly while it lasts. When it wears off, you will be left in a standard Sneak, with all of the benefits and drawbacks that Sneak has. Later in levels, HIPS becomes Improved HIPS, and also ensures that no slowing effects will apply during its duration, as well as giving you the ability to sneak at 100% movement speed, regardless of your natural Sneak Movement Speed. Finally, the most common use of HIPS is to remove you from a bad situation. Using HIPS in combat should remove you from combat and allow you to escape unharmed. However, at the time of writing, not even death always successfully removes you from combat. Until that is fixed, HIPS can also sometimes fail to remove you from combat. One of the lesser known abilities of the Burglar is one called Share the Fun. Using this ability, gained around level 40, you put yourself and one friend into Sneak, complete with Sneak Movement Speed modifier, and, as far as I can tell, your Stealth Level is shared as well. This should be used with extreme caution, however, as if the two of you get too far apart (and the range is not large), you both lose Sneak. For the Hobbit Burglar, Hobbit Stealth is also an option as racial equipped trait. However, as it is available to us less often than sneak, and does not obey Sneak Movement Speed, it is typically not used by Burglars. This ability is best left to the other hobbits. Let’s say you’ve got one really annoying NPC/Mob that’s perfectly placed. He’s looking right at you and there’s just no way that you are going to be able to sneak past him. Luckily for you, our handy toolkit comes equipped with a few nasty little surprises for just such an occasion. Diversion, a minor explosive device we keep handy, is one of them. Thrown at such a mob, it will land exactly on the opposite side of the mob from you, thus turning their back perfectly perpendicular to you. This has the benefit of ensuring that you’re perfectly placed for an ambush from behind if you so choose, or you can force them to look the other way while you pass behind them unnoticed. While Riddle can be used at early levels to temporarily take an opponent out of the battle, it cannot be successfully used for staying out of trouble in the first place, as it will remove your stealth on use. However, once upgraded to Improved Riddle, the ability can be used to confuse your opponent without them knowing you’re there. This will ensure that you can sneak past them successfully as long as you remain in stealth, or reduce the number of opponents you have to deal with at the start of combat for a few seconds. In the mid-levels, there is even an armor set bonus that changes Improved Riddle to affect up to three targets in a tight radius, giving you the ability to tell the world’s most confounding joke ever. You’re in trouble. Things are not going your way, and like any sneaky bugger, you’re now looking for the exit. Here are a few abilities that just might allow your getaway to succeed. As mentioned in Staying out of Trouble, HIPS allows you to duck out of combat during the battle and make a break for it. What if it’s already been used and is on cool down? Ready and Able refreshes nearly all cool downs the Burglar is currently waiting on. This includes Sneak, HIPS, Riddle, Stun Dust (Red Line), the forced fellowship maneuver abilities, and virtually all others, except itself of course. Use this, and then follow up immediately with HIPS for that sweat-wiping, heart-pounding escape you thought you weren’t going to have. Perhaps you’re in trouble and you feel you can finish the fight if you were just a bit more durable. Feel like taking a chance? Perhaps you’re going to make a run for it, but you can’t stealth. Using Touch and Go will give you a temporary +50% Evade chance above and beyond what you currently have. As such, if you have an evade rating of 25% (soft cap), you now have a 75% Evade rating for 30 seconds plus your Parry rating. Best of luck to them hitting you now! This ability can only be used every 5 minutes, however, without using Ready and Able to instantly refresh it, so use it wisely. It is worth noting that this ability can be used without breaking stealth if you want to start a fight with it as well. One of the most important abilities to have at the ready when fighting an opponent with channeled or induced skills is Addle. Addle allows you to stop your opponent’s induction or channeling, and increase the amount of time it would take them to use another one by 25%, and can be used every 10 seconds. With Legendary Item Legacy, this goes up to 75% induction time increase, which effectively makes most inducers unable to fight back without a lot of luck. Later in the game, Improved Addle also reduces their tactical damage by 10%, meaning that even if they succeed, it will be for less than they expected. Early in the game, Burglars are given the ability to cure a single poison applied to them every 15 seconds. Later, this becomes Burglar’s Antidote, and works on any two curable debuffs. 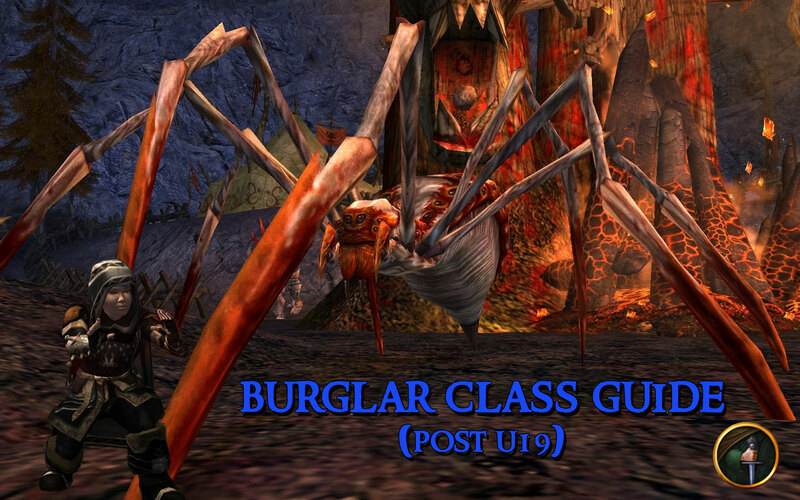 Yellow Line Burglars extend this even further by gaining the ability to remove two curable debuffs for their entire fellowship every 15 seconds. They got you. They got to you, and they knocked you out cold on the ground. For shame. Find yourself, Burglar! Brush yourself off and get back into the fight! Once you do, you will be 50% more likely to avoid further attacks for a short time via a 50% evade rating buff (combine this with Touch and Go for complete immunity to physical damage, i.e. melee and arrows), and will regain some of your morale to boot! That will teach them to knock you down! Wow. You really are the clumsy one. You’ve gone and fallen off a cliff now, haven’t you? Well, lucky for you, you have Safe Fall. If you don’t need to remain in stealth when you land, and the fall isn’t instant death, you will land on both feet, and despite the message stating that you took falling damage, will not receive the debuff associated with having done so. At least your enemy got the debuff if they were following you. Take them out while they can’t run, or run away yourself! One of the more interesting features of being a Burglar is the ability to acquire loot without all that messy killing. Humanoid NPCs can be burgled from melee range while in stealth, for a chance to get free loot. I don’t think I need to tell you that this is best done from behind, and preferably not while another opponent is watching, as the very act adds a roll for stealth detection, and you really don’t want that while your stealth level compared to theirs is low. Each humanoid NPC can only be burgled once by any Burglar, so if you have thieving friends, it would probably be best to leave them at home when you’re out making your acquisitions. Alternatively, you had best be prepared to kill your marks, or make arrangements not to be found on each other’s’ turf. Burglars have a keen sense of when treasure is about. Footprints are deeper, enemies are more guarded, and the light in the room just seems brighter. We have the unique ability to track it down when it’s in boxes, in fact, in addition to our crafting tracking. Only one tracking type can be used at a time, so you have to make your choice between picking up sticks, stones, half-rotten food, or old bits of paper, or shiny, beautiful gold and gems. I think you’ll make the right decision. If you happen upon a campfire with no one there to sell to, you have an ability called Summon Peddler that allows you to get rid of your ill-gotten goods to a trusted fall-guy friend. Most campfires these days are occupied already, and are getting rarer by the day, so unfortunately, this ability may go largely unused. Before I get into the types of Burglars, there are a few more items that all Burglars should know for combat situations, especially in large groups. One of the best known and most useful abilities all Burglars have is Reveal Weakness. This ability has a long range and increases the damage all of your targets’ enemies do to them, regardless of whether or not their enemies are in your fellowship, raid, or otherwise, and without breaking stealth. While most Burglars use this starting very early on to increase their own combat, a special note should be made for those who intend to fight the good fight in the Ettenmoors, that this ability should not be used prior to combat as is the norm for elsewhere, as your enemy will immediately know you are coming if you do so. Primarily used in Fellowships and Raids, Purge Corruption removes a Corruption from your target, indicated as a buff on your target with a Blue Border. Make sure you know what removing that corruption will do to your target by highlighting it with your mouse cursor prior to removal, or listen to your group or raid leader if you’re not sure before using this, as occasionally, removing a corruption will replace it with one that’s even worse. However, if your leader says remove all corruptions, well, you’re in luck, as this has a mere 15 second cool down on it, making it faster than most classes with the same task. The only forced Fellowship Maneuver that all Burglars have, Exploit Opening will perform an additional main hand strike, and if the opponent is not immune to fellowship maneuvers or stuns via innate ability or buff, will stun the enemy and start a fellowship maneuver if you are in a fellowship or raid of 2 or more people. If you are alone, you still get the damage and you still get the stun. Using this ability will give your opponent immunity to fellowship maneuver for one minute, so use it carefully. There are generally three types of Burglars in the world, and to say that one type is better than another is like saying one child is better than another. Honestly, who says that? I mean, that child is just trying to be themselves and enjoy life. You’re a terrible person. You’re a terrible, terrible person for even suggesting such a thing. Shame on you. The second most misunderstood after Yellow Line and most difficult line to understand at first and get started on, the Gambler relies on chance and combination attacks to subdue and wear down his enemy. He relies on “death by one thousand cuts”, rather than the quick and sudden death of the assassin. I will do my best to take the mystery out of this specialization once and for all. Damaging Gamble cannot be started with another gamble active and, as such, overwrites nothing. The first Gamble made available to the Blue Line Burglar is the Damaging Gamble. This gamble is an additional Damage over Time effect above and beyond any bleed effects you have applied to your opponent. This is the simplest form of a gamble, and the fastest way to kill your opponent. To begin a Damaging Gamble, with no other gambles applied, use Lucky Strike or Gambler’s strike. Lucky Strike will apply a Damaging Gamble with a strength between 1 and 6. Gambler’s Strike will apply a Damaging Gamble between 4 and 6. A second use of Gambler’s Strike will raise the Damaging Gamble to a rank of 6, maximizing the damage done by the gamble. Continued use of Gambler’s Strike will restart the duration timer for the Damaging Gamble. If you have gained enough trait points and selected the ability, this gamble can be used with Cash Out to create an additional direct damage strike. However, this should be timed to be as late in the gamble as possible, as the gamble will typically do more damage in its Damage over Time form than the direct damage strike will. An ability gained by adding the trait Blind Bet or Double Down, the Debuffing Gamble allows you to significantly reduce the damage output of your opponent. This gamble will apply with a random rank between 1 and 6 and has a very short duration. It must be consistently reapplied to maintain it. To start a Debuffing Gamble, you must either use Distraction before the fight begins (with Double Down), or: first successfully land a critical hit, followed by a well-timed Critical Response skill, as Blind Bet is a Critical Chain skill (see Critical Response and Chain Skills above in Terminology). To increase its potency, use Gambler’s Strike or Hedge your Bet after successfully starting the gamble and before its timer ends. This Gamble may also be used in conjunction with Cash Out to give the Burglar a short term Evade rating buff, removing the Debuffing Gamble from the mob, making the mob available for a Damaging Gamble again. Because it is a Daze, it can be refreshed without concern of immunity buff on the opponent when using Gambler’s Strike again as long as no damage has been done outside of Provoke and Gambler’s Strike. If other damage has been done to the mob, allow the daze to wear off and subsequently give them a one-one-thousand count before using Gambler’s Strike. If you do not, it will cause the daze to break and you will encounter a glitch where the gamble will show as a rank of 6, but the enemy will not be dazed. This kind of Gamble cannot be cashed out, so the only way to remove it if accidentally used is to wait it out, or follow it up with a Debuffing Gamble, which thus has a shorter duration and/or can be cashed out. One of my favorite unofficial combos to use on NPCs, especially ones with considerably morale, is the one-two punch. On critical, follow up with Gambler’s Advantage. Finish the chain with Blind Bet to apply a Debuffing Gamble on the enemy. Immediately use Cash Out to give yourself an Evade buff, and finally hit them with Gambler’s Strike to apply a Damaging Gamble. You have just decreased their damage, increased your evade rating, and applied two Damage over Time effects, because you scored one critical hit. Use this ability any time you are not using Debuffing Gamble to finish out your Critical Chains. It will add a touch more damage, and has a 20% chance to cause a Fellowship Maneuver. The ultimate Gamble, usable once per minute. All In gives you 15 seconds plus any time added by trait points of +50% attack speed, +50% Melee Damage, and +20% Evade chance. So what’s the big gamble? If you don’t kill anything within the time allotted , you will get a debuff of the same amount when it wears off, so -50% Attack Speed, -50% Melee Damage, -20% Evade chance. If you’re soft capped on Evade, using this with Touch and Go gives you a 95% Evade chance plus Parry chance, so go hog wild! By far the most popular choice of Burglars for its ease of use and easily quantifiable damage output, The Quiet Knife is the choice for those with their eyes set on quick assassination, hit and run tactics, and is far and away the fastest at back to back Fellowship Maneuvers. Red Line Burglars have an extra ability in their repertoire that allows them to guarantee a critical hit as long as the hit lands, at will. In early levels, this should be used as often as possible just before the ambush if using Surprise Strike. At later levels, save the ability for opportune times. We’ll get to that in a bit. One of the easiest to overlook abilities, and one of the most important when grouped, Feint Attack allows you to get near ambush level attacks again without having to re-stealth. This means that you get the same amount of damage from Surprise Strike or Cunning Attack while out in the open in longer fights. It also gives you the ability to use Trip after you’re out of stealth. It is worth noting that, like Blue Line, Red Line has a special Critical Chain ability called Flashing Blades. This ability should be used after each Double-edged Strike to maximize damage output. Surprise Strike (by far the most popular), which does huge amounts of damage, and at later levels, is guaranteed to critical on ambush with high critical multiplier values. Burglars using this ability are usually hoping to take off at least half their targets’ health in the opening blow. It is not uncommon for low mitigation and/or low morale targets to die in the opening ambush when using this ability. Cunning Attack, which applies a high damage output bleed on the target, which stacks with its lower damage output bleed counterparts after the battle starts, causing up to 4 bleeds on the target at once, all from Cunning Attack. By far the most dangerous way to start, but sometimes necessary for the highest morale opponents, as it also produces the most damage long term. When used with Aim and the Ithilien armor 4-set bonus, every tick is a guaranteed critical as of 19.1. Trip, which opens with a stun and Fellowship Maneuver, allowing the Burglar to incapacitate his target in the hopes that his damage output along with that of his or her fellowship is enough to down the target before the Fellowship Maneuver wears off or shortly afterward. Coup de Grâce, which isn’t technically an ambush ability, however, if used with Aim, all three swings are a guaranteed critical, which usually ends up producing more total damage than ambushing with Surprise Strike, and, if it kills the target or you do shortly afterward, puts the Burglar back into stealth, meaning you have just successfully killed your target and never truly exposed yourself if the target was alone. You are a ghost. Ok, you’ve played your hand, and you’re now out in the open. You didn’t kill the target with the ambush, so now you have to fight or flee. If you want to flee, see Getting Out of Trouble above. Let’s assume that’s not your choice. These options are not inherently exclusive to one another. Fellowship Maneuvers cannot be used while Stun or Fellowship Maneuver immunity is active (10 seconds after Stun Dust, 60 seconds after another Fellowship Maneuver minimum). In the case that you’re fighting a player or have the luxury of another player holding your opponent’s attention, you do have the option to remain behind your opponent (in the case of a player, this is going to require some dancing to hold your position, as they will not want you back there). Remaining behind your opponent will dramatically increase your damage output, generally prevent them from attacking back, with a few exceptions where attacks are in a radius from the attacker, and should aid in finishing the fight. As the name suggests, this ability is intended to be one final, finishing blow to your opponent. It requires you to have sufficient levels and points allocated to have the ability from the end of the Red Line tree. This ability uses three large attacks in rapid succession, and if it successfully kills your opponent, automatically puts you into stealth for a few seconds. To remain in stealth, simply use Sneak or HIPS while in Coup de Grâce stealth. To maximize your chances of killing your opponent with Coup de Grâce, you should ensure that your critical magnitude, physical mastery, and finesse are as high as you can muster while in this spec, and use Aim just before using the ability. The result will be three critical or devastating hits to your opponent, and with luck, a win. If none of these options or combination of options work and you’re not in a group, it is time to flee. You have played all the cards you have, and it’s time to run for it. HIPS and get out. By far the most underrated, misunderstood, and infrequently used specialization outside of raids is The Mischief-maker, or Yellow-line build. It is uncommon not only because it is designed to be used in a fellowship or raid as a support class and as such is not easy to solo with, but also because the equipment was once drastically different from the other two specs to be truly successful, requiring Will instead of Agility. This is no longer the case. The role of a Yellow-line Burglar is to provide some damage to the enemy while providing support to their fellowship. You will not be the best DPS on the team. You will not be seen as the best healer on the team, because your heals will not be massive, they will be little Heals over Time that add up to some maintenance healing. You may not even be recognized for having helped with heals, or curing, or anything else. What you will probably hear most often is “Wow, I’ve never hit for this much before!” from other DPS classes, while you do just OK damage. You need to be okay with that before you continue down this path. You will be an unsung hero of the fellowship. Tricks are the bread and butter of the Yellow-line Burglar. They are the debuffs delivered to the opponent, and removing the tricks can also give the Burglar the ability to help his friends. As such, if you cannot land the trick, which has an extremely high resist chance compared to any other class’ abilities, you’re out in the cold. As such, Finesse is very important to a yellow-line Burglar. Finesse has no cap, just like the primary stats (unless you somehow manage to hit 100% resist reduction, but good luck with that), and its sole purpose in life is to help you not miss and not be resisted. As such, you will want a little more Finesse in this build compared to others, so you can land those tricks. I find that 20-22% is plenty. Once upon a time, tricks did not have the ability to critical. This is no longer true. Tricks that have an initial damage on application can now critical and devastate, so don’t be afraid to keep your critical rating capped. It will not be wasted. Trick Removal is the act of cashing out (yes, just like in Blue Line) the trick you have landed on your opponent for a favorable buff for you or your fellowship, or additional damage to your enemy, once you have A Trick for all Tastes bonus. Trick Removals are much more difficult to resist, block, parry or evade than the initial trick, but in most cases still can be. Mischievous Glee – the goal is to heal Morale and, later in life, restore Power for you and/or your fellowship when it becomes Mischievous Delight. This is by far the easiest Trick Removal to use, and the easiest to see the benefit of. Plot twist: it’s a heal, for both morale and power. How do you make a heal more potent? You increase Tactical Mastery to increase your Outgoing Healing rating. Thus, Finesse to make sure you land the trick, Tactical Mastery to make the maximum use of it. Thankfully, Turbine now gives us 5 tactical mastery per Agility or Will, where previously we could only obtain it from Will. As such, it is no longer suitable or wise to stack Will as a Burglar, just stick to Agility for all forms of outgoing damage and healing. Once you have your Legendary Items, you will also have the option of selecting legacies that will improve the healing by over 100% at maximum potency, which appears to be calculated before Tactical Mastery bonus. Using Trickster and applying more than one trick means that when you use Clever Retort, you remove both and perform both FMs simultaneously, unlike the mixed FM that a fellowship performs. Startling Twist – This one is different from the other two in that it does not heal and does not benefit the group directly. It removes the trick and stuns up to 3 targets with tricks on them, also removing up 1 corruption from up to 3 different stacks from the target. Example: If an enemy has a single blue-bordered corruption, it will remove 1 stack from that corruption. If an enemy has 2 or 3 blue-bordered corruptions visible, it will remove 1 from each of them. However, an enemy with a single icon with a stack of 5 does not remove 3 from that single stack, it still removes 1 because it is a single stack. For best results, use Dust in the Eyes just before Startling Twist to ensure that 3 targets have a trick on them, and thus you are maximizing the potential of the ability. Yellow-line is by far the most dependent on an ability previously unmentioned due to its lack of importance, called Subtle Stab. Other trait lines use it only as an additional attack while other cool downs are unavailable. Yellow-line uses it to reduce the cool down of Trick Removal skills, thus increasing the frequency, and thus the overall potency of your support role. Use Subtle Stab every time it comes up to ensure that you can keep throwing Morale and Power out to your team as often as they need it, or to ensure that you’re able to create passive damage via Yellow or Red FM. Subtle Stab is now one of your primary attacks, with auto-attack and Cunning Attack being the other two. The role people will think you’re doing is Debuffing. Sorry if I’m ruining anything for non-Burglars out there. Yes, we will debuff the mobs, but we can only drop one trick on the mob at a time with a once-per-minute exception if we have the trait, and if we’re not removing the current debuff or debuffs and then immediately replacing them, we’re not helping as much as we can. As such, the tricks should always be moving if the Burglar is doing their job well as a Yellow-line. However, in the case of raiding, often times our primary task will be to boost the entire raid’s damage. In this case, it is correct to maintain the same debuff at all times. Trick: Disable – Single Target, difficult to resist. Reduces attack speed by 15% and damage by 10%. Use this if someone just pulled agro off the tank or if the tank is struggling to stay alive. Trick: Dust in the Eyes – Three Targets. Increases your opponents’ chance to miss by 20% plus bonuses, and reduces their run speed by 25%. Useful to reduce damage to someone or as a means to slow down a runner. Caution: this one breaks stuns and dazes! Combo bonus: Use this one followed immediately by Improved Startling Twist to stun 3 enemies at once and remove 1-3 corruptions from each of them at the same time! Trick: Counter Defence – Single Target, Reduces the target’s Block, Parry and Evade by 8 times your level, and their Critical Defence by 4 times your level. Great to use if people are having difficulty hurting the enemy or if a melee group member (or you) are low on finesse. Also a good one to use for healing, as it reduces their chance even further to avoid removing the trick, and with a cool down of one third its natural duration, it’s easy to see how this one can nearly always be available. Trick: Enrage – Increase the damage the enemy takes directly by 5% when fully traited. The easiest benefit to calculate, and the trick people will love you for the most. Not only does it increase everyone’s damage to the target, it also becomes a yellow FM when removed, which tends to be the highest total damage FM, assuming the target lasts long enough for it to take full effect. This will likely be your primary trick for most group or raid situations. The Exception to the One Trick Rule: Trickster – Once every 45 seconds to a minute (depending on trait points), after using the end of tree ability, Trickster, the next trick thrown will stack with the existing trick on the mob. It is important to always have a trick on the mob before using this, and it is worth noting that when you remove a trick with Mischievous Delight, you will remove the non-Trickster trick. Removing tricks with Clever Retort will remove both. Secondary and frequently more useful benefit: when you use this ability, all tricks you throw for its duration of 10 seconds are Area Effect, with a maximum of three targets. Hit them with something good! Suggestion: to maximize damage to a target, open with Enrage, followed by Reveal Weakness, then Trickster, followed by another Enrage. While it will not work on some raid bosses, this should produce a double-stack of Enrage for a total of 10% additional damage on top of Reveal Weakness, which currently maxes out at +18.6% at rank 59 LI legacy, for a total of 28.6% additional incoming damage to the mob. Worst case scenario, only the Trickster version will land, and you will still have 23.6% incoming damage. Continue using Enrage to keep the non-trickster version active and/or for additional initial-application damage. After 39 seconds (with full Playful Mind), the Trickster copy will expire, leaving the incoming damage down by 5% for approximately 6 seconds. As soon as Trickster is available again, drop another Trickster-boosted Enrage on the target. Continue until the mob’s untimely death. Small Snag/Quite a Snag – This is neither a trick, nor a trick removal, but a 10m ranged melee skill, and in that, it is a rarity for the Yellow-line Burglar. This ability allows us to root a mob in place for 15 seconds, with a 50% chance for the enemy to break root on damage. When it becomes Quite a Snag, it produces an additional 3% stacking incoming damage buff, and reduces opponent attack duration by 10%. It can also, on chance, trigger a buff that increases trick application and removal damage once it becomes Quite a Snag. This should be used in the rotation for maximizing DPS in a group or raid scenario, but be careful where you potentially root your opponent. The final benefit to having a Yellow-line Burg in your fellowship is the ability for the Burglar to cure two curable debuffs for the entire fellowship at once. This is especially useful in raids where “eyes” are dropped on players, or bleeds that need to be cured. It leaves the dedicated healers available to keep the tank and members alive, rather than having to stop healing to cure someone else. Ideally, that person should have cure potions on them, and many classes have the ability to self-purge in some way, however, there is always that scenario where both options are unavailable to that person through bad timing, and that’s where we come in. Make sure you use Burglar’s Antidote to cure your fellowship and keep them alive for longer any time it’s available and makes sense. You have a genuine choice to make when choosing what weapon you want to use as a Burglar. While we don’t have the selection that some of the melees have, we can use most one-handed weapons. I intend to give the pros and cons of each and let you make an educated decision. The most obvious choice for most Burglars, and the one most of us start with is Daggers. We have a class bonus of up to 5% additional damage when using daggers over any other class, so it seems like a natural choice. In addition, daggers provide an additional 1% chance to critical with auto-attack, giving us slightly more frequent Critical Response skills and Critical Chains. This is a good choice, and potentially now the best choice, when available. The next best choice is to go with is the weapon that your race gives you a benefit toward. For Burglars, this means Clubs for Hobbits and Swords for Humans. Your racial ability will give you a 5% damage bonus toward that weapon type, so the only loss is the auto-attack critical bonus, but a gain of the weapon’s bonus instead, which, in the case of swords, is 1% additional parry chance. The club bonus is far less useful by comparison. While it is not a path I would recommend, some Burglars choose to use our other weapon type, Maces, for the 1% chance to reduce the target’s run speed. An example of when this might be useful is fighting in the Ettenmoors or dueling. However, there are many other ways to slow down a running target that are more reliable. Maces are, in my opinion, best left to other classes. Once the main-stay of yellow-line Burglars, these are no longer necessary or viable. Stick with Agility-based off-hands, preferably a dagger or your race-bonus weapon. The selection of your bridle should match the war steed you intend to use. For example, if you were to use the light steed for its constant Dash and high damage output, you should be using a light bridle to match, as the major legacies for specific abilities will be locked to that steed type, ie. ‘Wrath’ Critical Chance (Light Steed). Your bridle does not need to be maximum quality, as the point system is set up in such a way as to allow, assuming maxed out legacy ranks, all points to be placed in the legacies, and the leftovers into Fury Bonus Contribution. Third Age will reach rank 5 of Fury, Second Age will reach rank 6, and First Age will reach rank 7. The maximum points is the only difference between the age type. The difference between a third age and first age is 338 Fury, on a bridle with over 20000 fury (20618 vs 20956). The difference is 1.6% in bonus damage. Make a First Age only if you genuinely have nothing better to do with your symbol, as you are not likely to notice a difference over a Third Age. Spend your efforts on scrolls of empowerment to max out the legacy rank and on relics. This allows for maximum end of tree functionality, maximum damage for each of the damage specs, and maximum healing for the healing spec for both solo and group play. Alternatively, if you do not use Riddermark for dismount and debuffs during group play and intend to solo only, you can replace Disengaging Strikes Dismount Chance (Light) with Class Skill Damage Over Time (Light) and replace Riddermark Skill Direct Damage with War Steed Strength to maximize Red Dawn damage. Keep the Rohirrim legacies, as you will need to periodically switch to Rohirrim to heal yourself during longer fights. Note that the minors are the same as for Light. With all steeds, Red Dawn and Riddermark are damaging trees, Rohirrim is for self and group heals. As before, if you do not intend to use Riddermark, replace Strong Willed Skill Duration with Class Skill Damage Over Time Pulses (Medium), and Riddermark Skill Direct Damage with War-steed Strength. There aren’t too many situations where a Burglar would want to set themselves up in this way. However, if you’re going to do it, do it right, and set yourself up as a full tank. Plan on spending most of your time in Riddermark, with the occasional switch to Rohirrim for heals. Red Dawn would only be used for Trample in this setup. Note: this is not the Bridle Westemnet Rune of Perseverance, as it has only +4 war steed acceleration rate. Should that be fixed in the future, the recommendation will change to that rune. Note: The reason we do not use the Sealed Westemnet Bridle Emblem of the Rider is two-fold: 1) you are not likely to remain in range long enough to get more than two hits in, at which point, the attack duration buff is wasted (and you already have 15% improvement on the setting), and 2) the additional acceleration on the acceleration emblem, when combined with the Riddermark Rune of Perseverance, allows you to effectively instantly hit top speed from a stop or any slower speed, and recover quickly if you need to stop or slow down at any point in the fight. The turning emblem is almost required to make the heavy steed turn at a viable rate for combat. You’ve gotten yourself in with a bunch of do-gooders with a plan to kill something big. Good job. You’ll not likely be able to run away this time if it gets thick. The first thing you’ll need to know is that all those people and their spells, shouts, and blades flying every which way is not likely to be terribly compatible with your attempts to quietly control the situation as you normally would. Tell your riddles and use your disabling gambles as far away from the group as you can manage to avoid someone snapping your opponent out of their stupor early, or you’ll just end up frustrated. The second thing, and this is extremely important: you are there to assist the group, not to be the star of it. Our most useful abilities in a raid are largely in the Mischief-maker tree, so expect to be yellow line for most fights. If you’re not helping everyone else be their best, you’re a waste of a player slot, as there are many classes that can equal our damage output. Third, and you may have already felt this way, but survival is the most important thing you can do. DPS is a distant third to staying alive and keeping mobs debuffed. Yes, I know. You likely signed up to assassinate and steal, but in reality, we’re best known and most welcome when playing practical jokes like a trained animal. Don’t shoot the messenger. All builds are based on the maximum point count of 82. Morale: As much as you can get, minimum 30k, ideally around 50k. Note: there is one fight that is the exception, and as such, you should be prepared with both high morale gear and lower morale Red line gear. For Vadokhar in Throne of the Dread Terror, you will be better off at 25k morale or less, as he does percentage based damage, and therefore the more you have, the more the healers have to heal, with no actual benefit to you. Do not attempt to fight with fewer armor pieces, as this will increase the damage done to you. See Essence Counts and Locations for suggestions on how to make this as painless as possible. Incoming Healing: whatever you can get, don’t spend too much effort on it compared to the others. In a raid, no one cares how much mastery you have, or how much DPS you do if you die and reduce the raid’s DPS or increase the mob’s offenses back to its baseline as the case may be. Your job is all about staying alive and debuffing. You are the medium version of the Captain or Lore-master, with everything that goes with that except the resurrection abilities. Any DPS you get above and beyond that task is icing. For a Red Burglar and/or smaller group activities in Yellow or Blue, rather than getting maximum morale, you just need to be over 30k morale for most T2 fights, critical capped (which can be obtained from Agility essences and LI relics, do not slot critical essences), and maximum mastery. “OK” is 65-70k mastery, “Above Average” is 75k, “Good” is over 80k. However, I would not expect to be able to use this build in most PvE raids. This would primarily be for dailies, 3 and 6-person groups, PvMP, and soloing. Note: in addition to your standard gear, I recommend picking up any two pieces of Osgilliath armor box pieces from Dome of the Stars, Ruined City or Sunken Labrynth T2C runs. The yellow-line 2-set changes Riddle into a two target ability, allowing you to single-handedly perform the crowd control required during the gambits in Throne of the Dread Terror, as well as mesmerize two of the ranged spirits at the end of Silent Street, both of which are quite useful to the rest of the group. Alternatively, there are armor pieces around the level 75 range that have the same set bonus with three target, but with much lower stats. For lower level Burglars, adjust downward as necessary or stick to standard relics until you craft your level 100 Legendary Item. “Confidence?” I can already hear you saying. Hear me out. They were exceptionally useful back in Update 16 era, and could very easily make a comeback. Vitality tomes are essential for a raiding Burglar. Get them to the current cap as soon as is feasible. Not having them maxed out will not prevent you from attending or doing your part, but it will increase the difficulty in getting the numbers listed here and, as such, less likely that you will achieve them. If you’re serious about raiding and have to choose one, choose Vitality over Agility. Agility tomes are for non-raid play. You don’t need high mastery and critical rating is mostly for doing damage, which is not your primary role. Fate tomes should be tertiary, as their 2.5:1 ratio for critical rating will be effectively wasted on an easily critical capped character, and therefore will only add critical magnitude, tactical mitigation, and regeneration. That said, having up to Fate 12 will allow you to pull one tactical mitigation essence out of your armor for another essence (see Essence Counts and Locations) Will and Might tomes can be ignored entirely unless you’re looking for strange bragging rights. Supreme Essence of Masterful Agility: Remainder if you have any slots left, should have 8-9 left if best in slot pieces are available (in jewelry). If you do not have a slotted pocket available to you, or have not yet finished your flower jewelry, subtract 3 for the pocket, and 1 per jewelry piece you have not finished. This still allows for all or nearly all of your minimums to be met, and only your mastery is low, which is not an issue for a raiding yellow Burglar. So, why do they go in specific slots? The goal is to minimize the number of swap pieces we need for the two different specs/builds. The finesse, mitigation, and masterful agility essences are common to all specs. The armor may not be, especially when set bonuses come into play. As such, the essences that are specific to raiding yellow are put into the yellow armor, the essences that are specific to red are put into the red armor, and now only armor and legendary items need to be swapped to change spec builds. Same jewelry, but in the armor, slot Robust or Masterful Agility essences. I would recommend using all robust in the armor, as you already have around 9 masterful agility essences in your jewelry, and going full glass cannon leaves you at under 20k morale. Now, there is something to be said for that, as you will be just shy of 100k mastery. However, using robust agility essences, red line will be over 25k morale with more than 84k physical mastery. With the +10% morale at the top of the yellow tree, that morale jumps to over 29k, and you’re ready to raid in red. If the raid leader insists upon you being over 30k, slot 1 yellow-line armor piece, and that brings you up to 32-33k without losing a set bonus, losing less than 5k mastery to do so, meaning you’re now at 32-33k morale with ~80k mastery, which is a respectable setup no matter how you look at it. So, then, do you still want in? Are you sure you have what it takes? Good, because the Guild leaders ain’t no slouches with a blade, and they will not hesitate to gut ya if you so much as make a stupid move that even threatens to hurt one of our members. May the Valar be with you friend, and good luck down there. That’s a great start – but it really needs a section covering Interrupts. Burgs are the best interrupters in the game. Addle is our go-to choice, with a good range, extra debuffs, and only a 10 second cooldown. But that’s just the beginning. Riddle works very well (and can have a very long range with the right legacy). We have numerous stuns, especially in the Gambler (blue) line. And the Mischief-maker (yellow) line Dust in the Eyes followed by Startling Twist is a nice 3-target interrupt — I splash that in all my lines. On top of all those, we can open an FM (using Trip, Exploit Opening, and if we’re really desperate, Marbles). FMs will interrupt almost everything, even scripting (some bosses are immune). With interrupts like this, I was able to solo the Udunion instance once – I can’t imagine doing that on another class. All very valid points ! I will seek out the author to see about some updates. Do you plan to add any blue or red line builds? In particularly trait and LI builds. I am working on my burg now and not too interested in yellow yet.